In this fast- paced, high-tech digital world, OPUS Vancouver is staying switched-on and tuned-in to the latest technology. 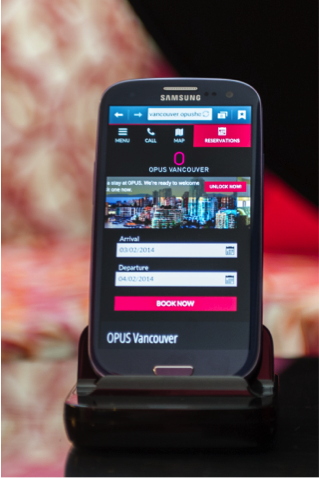 From in-room iPads and Samsung Galaxy S3 smartphones to TELUS Optik televisions, OPUS keeps guests connected wherever they go. Keeping guest needs in mind, OPUS has upped their WiFi to triple its former capability. Guests will enjoy lightning fast speeds on multiple devices while surfing the web. OPUS is proud to offer WiFi at no cost to their guests. Another new feature added to the guest rooms is TELUS Optik TV. Guests can now enjoy 30 HD channels with access to the latest on-demand movies, pay-per- view events and hundreds of specialty channels. Craving the cinema experience without the crowds? Host your movie night in one of the Signature Suites that are equipped with 55” 3D LED TVs (3D glasses included). A new high-tech amenity was the addition of iPads in all guestrooms which can be used on and off property as your virtual concierge. From pre-loaded music to specialty apps and games, OPUS encourages guests to take the in-room iPad’s about town and explore the city. All iPads are equipped with a complimentary app Press Reader, giving guests access to over 2,300 newspapers in 55 languages. Stay in one of the Deluxe King rooms and above to relax and surf the web without racking up cellular data with the hotel’s Samsung Galaxy S3 smartphones. Guests can stay connected via the complimentary data network allowing access to the internet in any location around the city. Phones are configured for complimentary incoming calls. Outgoing calls can be made for; $0.10 per minute locally, $0.20 per minute North America, and $0.30 per minute International. Out and about? Guests of OPUS take the hotel concierge with them wherever they go. By simply dialling 0 on the Samsung Galaxy S3, guests are directed to the OPUS Hotel concierge. In addition, all incoming calls ring simultaneously on the Samsung and in-room phone, ensuring guests never miss an important call. Coming soon is the new OPUS Hotel App, which offers guests a virtual concierge right at their fingertips. Explore all the amenities the hotel has to offer, as well as local attractions, neighbourhoods, shopping and dining.